A pet or an ornament? People often ask to buy Angora rabbits as pets, but although probably the calmest and sweetest of breeds, they do not make good pets for children for two simple reasons. Firstly, rabbits are one of the cleanest of animals (I do not even have to wash the wool before working with it!!). This means that every time you handle your rabbit, it will wash the salts from your skin off its coat. This results in wool being swallowed which can cause a wool ball to develop in the stomach of the rabbit. Secondly, it cannot regurgitate like a cat does, so this wool ball just sits there growing bigger and bigger till the rabbit starves to death. This can be prevented and treated with natural enzymes in papaya and pineapple, but must be recognised and treated promptly. None of my rabbits get handled other than for wool harvesting or routine treatments like toenail clipping or deworming. Sorry, no cuddling of longhair bunnies allowed, for their good!! I had been keeping rabbits since 1986, and I still remember that my aim when I started was to breed a blue satin rabbit. I went about it all the wrong way, with every error possible being committed, and you know, the blue satin is still eluding me! 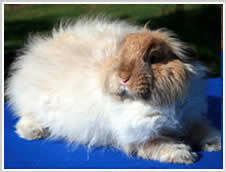 In 1999 I purchased a few Angora Rabbits, intending to try and breed a show rabbit (at least this I have achieved). The problem is that our basic herd in SA is commercial, not showable - I quickly became fascinated with the colour genetics of the Angora. In time, from about 15 rabbits in four basic colours, I bred up to a herd of between 300 to 400 Angoras, in 15 colours or shades. The next step was of course to harvest the wool, then came the shocker, what to do with all this wool. I found an outside spinner immediately, up near Hazeyview, on the other end of the country, and used to move the wool backwards and forwards, raw and spun. Over the next few years, I learned to spin, weave and felt, and found it the most fascinating journey. Working in the natural colours and shades constantly urged me on to breed new colours and shades for more subtle blends and effects. As is always the case, your natural colours are more “earthy”, but the blends and subtleties are stunning. However, we do also keep from the shorthair breeds, and have a selection of other breeds as well. This includes the Silver Fox (a superb child’s pet), Jersey Wooleys (Like a mini Angora, but with a tight non moulting coat), New Zealand White and New Zealand Red, Californian, some rex, and some satin. We do sometimes have rabbits for sale, in both the Angora and the Shorthairs, and I am always available for advice on the care of the rabbits. We care for our rabbits! We give our rabbits individual care - and do regular checks for problems such as ear canker and long claws.